To Rabbittown is now only 99 cents on iTunes, Kindle, Nook–yippee! (Picture me jumping up and down like an over-caffeinated kangaroo…) Download the free Kindle for PC if you don’t have an eReader. 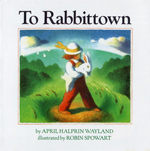 TO RABBITOWN is the first picture book I ever had published (by Scholastic). It’s a free-verse fantasy (gorgeously illustrated by Robin Spowart) about a child who runs away to live with rabbits and slowly turns into one. A child runs away to live with rabbits…and slowly turns into one. Written in free verse, with gorgeous watercolor illustrations by Robin Spowart. They really are gorgeous. Someone once told me that it looked like a French picture book. And…it was MommyCare’s Book of the Year!